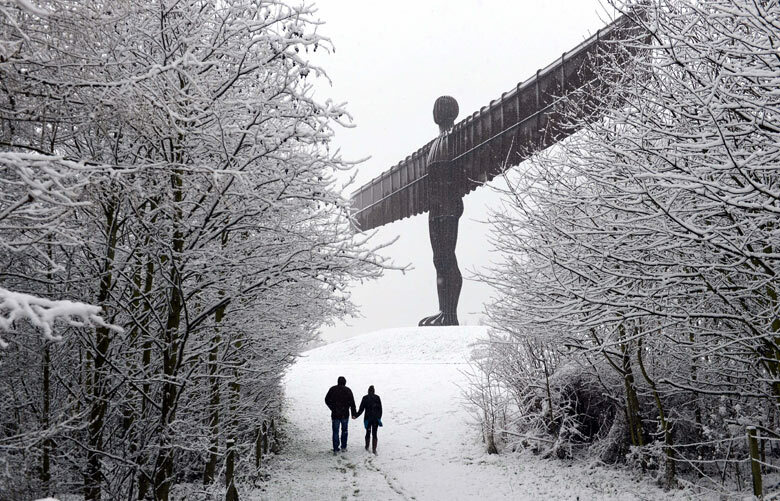 A series of black and white images of ‘The Angel of the North’ in the winter snow captured by photographer Owen Humphreys, and widely published in the UK press and media over the last few days, seem to have inspired a surge of ‘Angel of the North’ related Tweets. I thought it would interesting and timely to Storify some of these here, to evidence some of the different ways in which people are using Twitter to disseminate their personal engagement with ‘The Angel of the North’ (Antony Gormley, 1998). For now this is just meant to provide a kind of online storage space for a sample of this material and an initial indication of possible themes for fuller and more formal exploration later. It’s also a bit of a personal experiment for me in using Twitter, Storify and social media more generally as a resource for data collection and analysis within my PhD research. Many of these recent Tweets are linked to images. These seem to fall into three basic categories: (1.) A large proportion consisted of links to and retweets of the Owen Humphrey’s photos published in The Guardian, The Independent, the BBC website and elsewhere. (2.) Original photos recording visitors’ own recent snowy experiences of ‘up-close’ visits to the sculpture. (3.) What could be called ‘drive-past’ or landmark shots – a glimpse or view of ‘The Angel of the North’, clearly captured from a moving car. Several of these images are accompanied by messages or hashtags linking these ‘sightings’ to notions of ‘arrival’. Text-based tweets reflect a range of other personal responses and allusions. These might be grouped as: (1.) Those that reference ‘The Angel of the North’ as a physical location or progress marker. (2.) Those that offer emotional responses, opinions, ‘facts’ or imaginative speculations about the sculpture. (3.) Tweets that link ‘The Angel of the North’ with wider public art discussions. (4.) Tweets that appear to use the title ‘Angel of the North’ as a phrase to describe someone or something else other than Antony Gormley’s sculpture.